The College of Humanities and Social Sciences has named Anne Green the winner of the 2004-05 Elliott Dunlap Smith Award for Teaching and Educational Service. 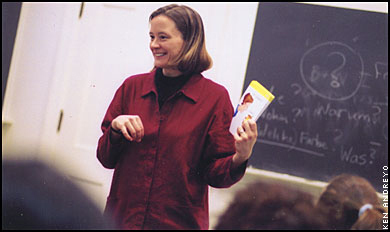 PITTSBURGH—The College of Humanities and Social Sciences at Carnegie Mellon University has named Anne Green, a teaching professor of German, the winner of the 2004-05 Elliott Dunlap Smith Award for Teaching and Educational Service, which is given annually by the college to honor excellent undergraduate teaching. Since joining the Carnegie Mellon faculty in 1993, Green has taught courses across the range of the German curriculum, although she has focused most of her attention at the elementary and intermediate levels. She has devoted much of her time to reviewing and revising lower-level courses and has played a significant role in the development of Web-based instructional materials. Green also has specialized in the incorporation of children's and youth literature into the curriculum. "The Elliott Dunlap Smith Award is a shot in the arm, reminding me again how much I love teaching. I'm very grateful to my colleagues who nominated me for this award," Green said. Green has played an increasingly prominent role in regional and national professional organizations such as the Northeast Conference on the Teaching of Foreign Languages, the American Association of Teachers of German (AATG) and the American Council on the Teaching of Foreign Languages (ACTFL). She was honored by ACTFL in 2001 for her excellence in foreign language education using technology. Green has developed a national reputation for her work; she has recently been elected vice president/incoming president of the American Association of Teachers of German. "Anne Green is an outstanding educator and is richly deserving of the Elliott Dunlap Smith Award. She is an outstanding teacher who is beloved by her students. She is also a national leader in German education," said John Lehoczky, dean of the College of Humanities and Social Sciences. "She is a wonderful inspiration to students and colleagues to strive for the highest standards of professional excellence." Elliott Dunlap Smith was provost of the Carnegie Institute of Technology from 1946 to 1959. He also was the Maurice Falk Professor of Social Relations. He and President Robert Doherty forged the Carnegie Plan for Professional Education, a program to train men and women to become creative and productive professionals.